Corporate responsibility is progressing beyond the marketing campaign. Businesses are truly becoming more accountable to people and the planet, in addition to their own profitability. That’s great news. But there’s a disconnect between what companies are doing and what they are saying. While more companies are becoming sustainable and responsible, they are still not skilled at communicating their good work. Why? Fear. Many marketing and communications directors are afraid of sounding inauthentic, they are self-conscious about not having joined the movement sooner, or they worry they aren’t doing enough to talk about it. But here’s the rub. If companies that are committed to doing the right thing aren’t talking about it, they are doing the corporate responsibility movement a disservice and simultaneously inhibiting their own growth. 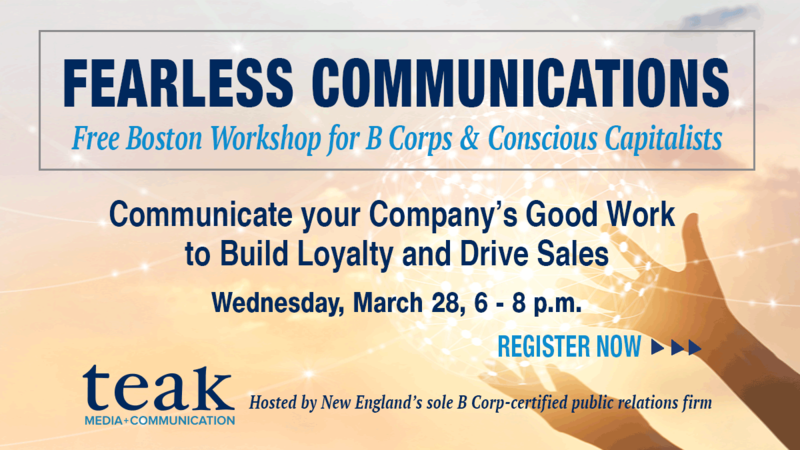 Wednesday, March 28 from 6 to 8 p.m. Wine, appetizers and networking from 6 to 6:30 p.m. Workshop and Q&A from 6:30 to 8 p.m.
Jackie Herskovitz Russell is the founder and president of Teak Media + Communication, New England’s sole Certified B Corp public relations firm. Founded in 1997, Teak empowers responsible companies and nonprofit organizations to achieve widespread recognition and increase their revenue. As a former reporter for daily newspapers, Jackie understood the power of the media and wanted to leverage it to help nonprofits and responsible businesses grow and continue their good work. Teak believes in the power of business as a force for good and Jackie is convinced that businesses have both the power, and an obligation, to change the world for the better. By providing communication services that are based in the disciplines of traditional journalism and digital media, Teak helps important businesses grow. The company accepts the promotional responsibilities of companies and organizations whose ethics and values are aligned with the Teak mission. Along with its B Corp affiliation, Teak Media is a member of the Sustainable Business Network of Massachusetts, Social Venture Network, Climate Action Business Association, the Greater Boston Chamber of Commerce, and is a founding member of the Boston Chapter of Conscious Capitalism.